Osteomyelitis, or infection in bone, has a wide variety of radiologic and histologic features. Early acute osteomyelitis may present as an aggressive lytic lesion. Chronic osteomyelitis produces extensive reactive change. Microorganisms find their way into bone by two mechanisms, via the bloodstream or via direct invasion. When bone is infected via the bloodstream, a syndrome known as hematogenous osteomyelitis, organisms originate elsewhere in the body. In direct invasion, often referred to as secondary osteomyelitis organisms are inoculated directly into bone from an adjacent soft-tissue infection or, as in some open fractures, from a source outside the patient. Bone infections are usually caused by bacteria, though they may result from any kind of microorganism. The clinical syndrome associated with the initial invasion of microorganisms is known as acute osteomyelitis. If the infection is not completely eradicated, a continuous interaction of microbial growth and reactive bone formation results in chronic osteomyelitis. On occasion, an episode of acute osteomyelitis is subclinical. A patient’s defenses confine the infection to a localized zone of the bone. This presentation is called subacute osteomyelitis. The initial phase in the pathogenesis of osteomyelitis is bone destruction with an abscess formation. Cytokines, released from the inflammatory cells, activate osteoclasts to resorb bone. These cytokines include tumor necrosis factor (TNF), interleukin-1 (IL-1), prostaglandin E2, and others. 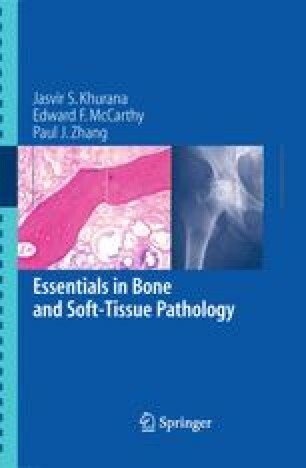 Although osteoclasts are responsible for resorption of viable bone in all physiologic and pathologic states, there is some evidence that inflammatory cells may be able to resorb necrotic bone.